The forests of the CNP are home to around 80% of the UK’s capercaillie. Much work continues to be done to ensure that these forests remain a vital refuge for this highly endangered and charismatic species.The Cairngorms National Park Partnership Plan identifies active conservation for ‘priority species’ in order to ensure the species for which the Park is most important are in better conservation status. Capercaillie is identified as a species for priority and focussed action over the next five years. 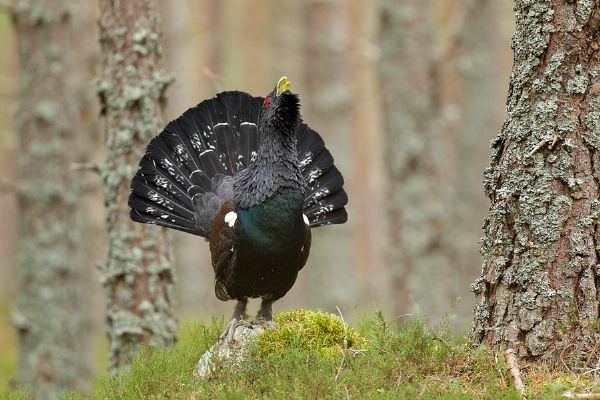 The Capercaillie Framework pulls together all the information relating to Capercaillie distribution, the pressures they face and the current management measures being undertaken. This is being used to make decisions about their future conservation management across the entire National Park, so that work which includes habitat expansion and access management can be directed to where it is needed most. The Capercaillie Biodiversity Action Plan (BAP) Steering Group is responsible for implementing the Species Action Plan for Capercaillie on behalf of the UK Biodiversity Partnership. The group meets several times a year and has recently developed the “Research and Management Framework” to identify and prioritise the management needs. The Capercaillie BAP Group project officer, funded by RSPB Scotland, Scottish Natural Heritage, and Forestry Commission Scotland, runs the group and is responsible for coordinating delivery of the Species Action Plan. The Capercaillie Project Officer also has an advisory role, conducting habitat surveys free of charge and helping land managers apply for grant schemes.